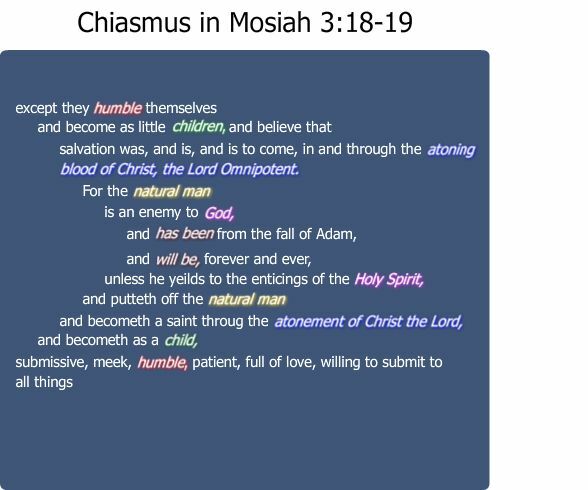 King Benjamin's complex ceremonial speech in Mosiah 2–5 contains several excellent examples of chiasmus. The overall structure of the speech is chiastic and houses smaller chiasms within it. (For a more detailed representation of the speech of Benjamin as a whole, see chart 87.) This chart shows only one of the chiasms found in Benjamin's speech. Notably, the main chiasms in Benjamin's speech concern the doctrine of Jesus Christ—the doctrine Benjamin wants to emphasize. This particular chiasm, which comes at the midpoint of the entire speech, concerns the crucial process of being spiritually reborn through the atonement of Christ.